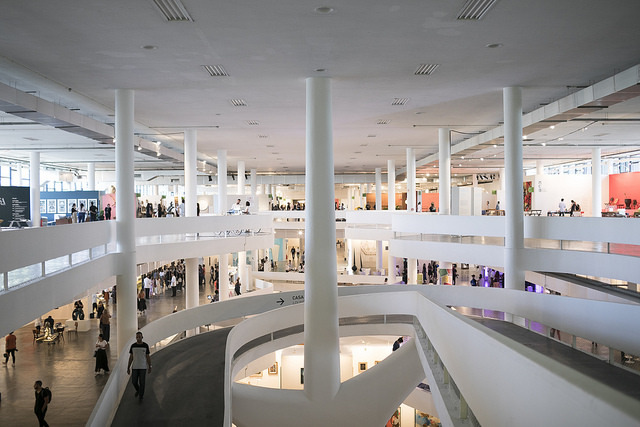 SP-Arte brings Brazil’s top galleries for its fifteenth edition from April 4 to 7 at the Ibirapuera Pavilion at São Paulo’s largest public park. Among the international establishments that will participate are Lisson Gallery (London), Neugerriemschneider (Berlin), Galleria Franco Noero (Turin), Galleria Continua (San Gimignano), and David Zwirner and Alexander Gray Associates, both from New York City. 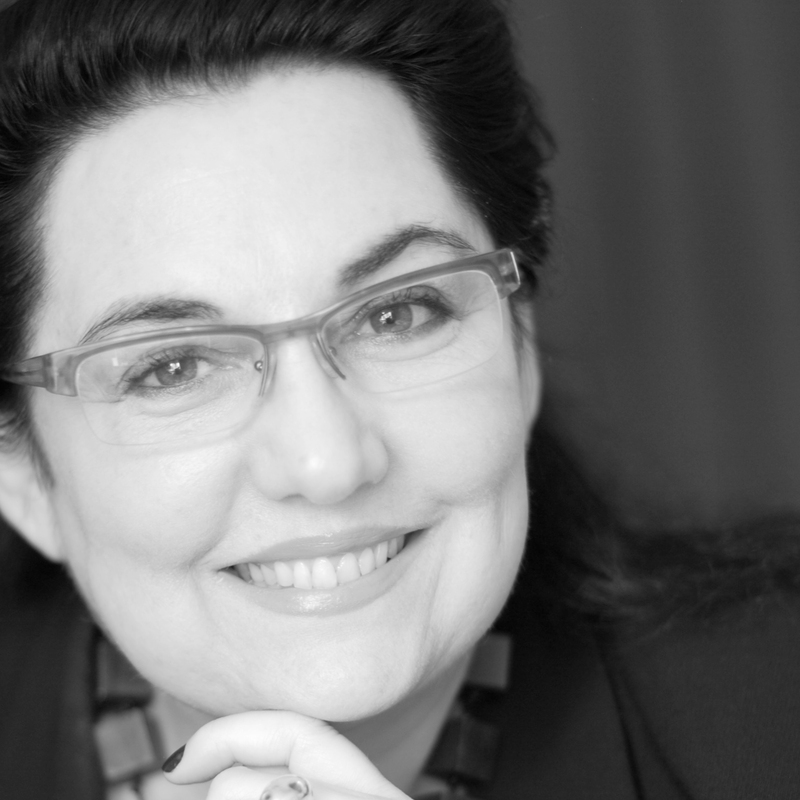 Bendana Pinel, from Paris, joined the newcomers, which also includes South American galleries Patricia Ready and Die Ecke Arte Contemporáneo, both from Chile’s Santiago, and IK Projects from Lima. The event officially called Festival Internacional de Arte de São Paulo has lived up to its name. 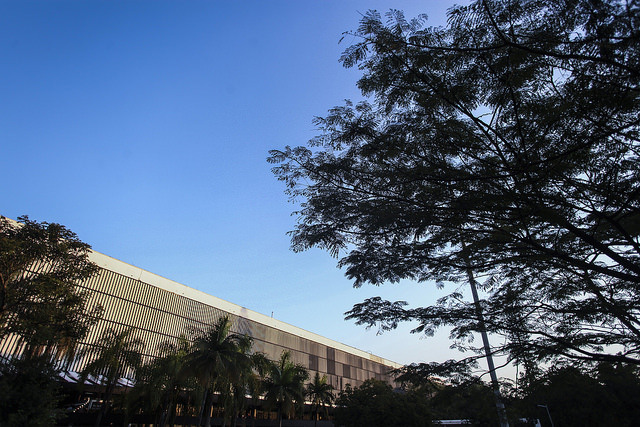 “In its fifteen years, SP-Arte extended its mission by contributing to the expertise of the local market and expanding collecting in Brazil,” says founder Fernanda Feitosa. Beyond the expanding program inside the venue, the art fair radiates a movement that sweeps the city from mid-March to November. The city’s two main museums display important retrospectives that coincide with the fair. The MASP stages the largest exhibition to date on the oeuvre of Tarsila do Amaral as well as a show on Lina Bo Bardi, the Italian-Brazilian architect who designed the museum’s iconic brutalist architecture. The Pinacoteca complex brings two very different sculptures in its two buildings, Ernesto Neto’s work invaded the Pina Luz and Artur Lescher occupies the Pina Estação. The beginning of the art season in the gallery circuit means the opening of several exhibitions: Servulo Esmeraldo is at IAC (Instituto de Arte Contemporânea), Swiss artist Philippe Decrauzat debuts at Galeria Nara Roesler, American artists Tom Burr and Al Freeman are at auroras, photographer Claudia Jaguaribe’s images dialogue with sculptor Liuba’s pieces at Galeria Marcelo Guarnieri, Cristiano Mascaro’s black-and-white architectural photos are at Cidade Matarazzo, Luisa Almeida and Sani Guerra have a pop-up show at Emma Pop Project, there is a group show at Choque Cultural, Rydias is at Central Galeria along with a collective exhibition from London’s gallery The Sunday Painter, Nuno Ramos opened at Fortes D’Aloia & Gabriel Galpão, Rivane Neuenschwander at FDAG Galeria, Argentinean Teresa Nazar is at Berenice Arvani Galeria, Thiago Mello Martins is being staged at recently associated Leme/AD, Cuban artist Carlos Garaicoa has a solo show at Galeria Luisa Strina, Scottish artist Daniel Mullen debuts at Emmathomas Galeria and Catalan Antoni Tàpies is being displayed at Bergamin & Gomide. Not far from SP-Arte in the Jardim Europa neighborhood, the works of Guy Veloso, No Martins, Osvaldo Gaia, Rafael Zavigli, Renan Cepeda and Tatewaki Nio are being displayed at the minimalist studio of Spanish-born artist José Zaragoza, who passed away two years ago, and was also a major name in local advertising and one of the city’s influential personalities in the art scene. The exhibition, “Paisagens, horizontes e trocas” (Landscapes, Horizons and Exchange), was organized by art consultant Escritório de Arte Rosa Barbosa and curated byTheo Monteiro, the subject of our interview. 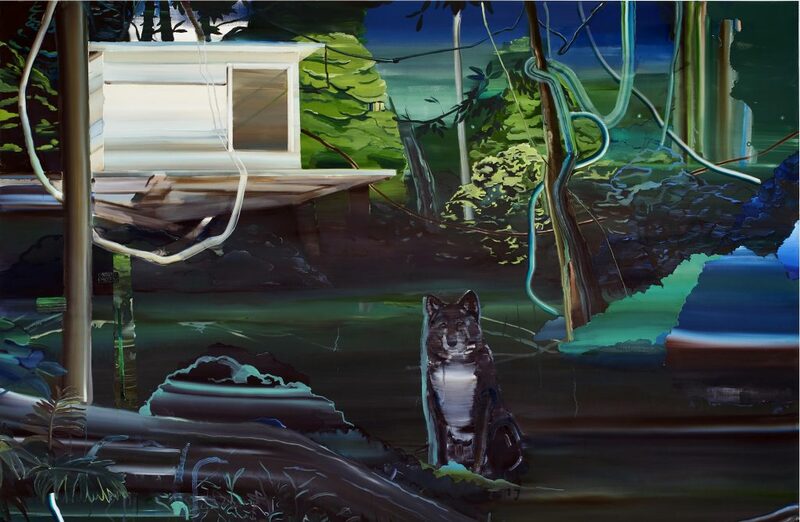 Theo, through what angle does this collective show views the subject matter of landscapes (paisagens)? Experts like Anne Cauquelin, author of the essay “L’invention du paysage” and English art historian Simon Schama emphasize that the comparison of nature to landscape is inaccurate since landscape is a human creation that deals with the way we, human beings, perceive nature and transform it into a cultural manifestation with symbolic representation. Following this train of thought, the narratives of the artists on show deal with the metaphorical landscape in very personal compositions. Tell us about this approach on the work of Minas-born painter Rafael Zavagli. Zavagli’s oil paintings explore an array of blue and green tones on slick textures on collage-like large compositions made of different, superimposed planes that are summed up in perspectives defying to the eye. His scenes are impregnated with a somber silence that hints to the lives that are absent in the canvas. Now let us move on to Rio-born Renan Cepeda, who is an international award-winning photographer. The meticulously constructed landscape photography of Renan Cepeda comes about through the technique known as light painting that adds mystery and drama to his low-light, long-exposure photographs that is akin to painting with light instead of a brush. 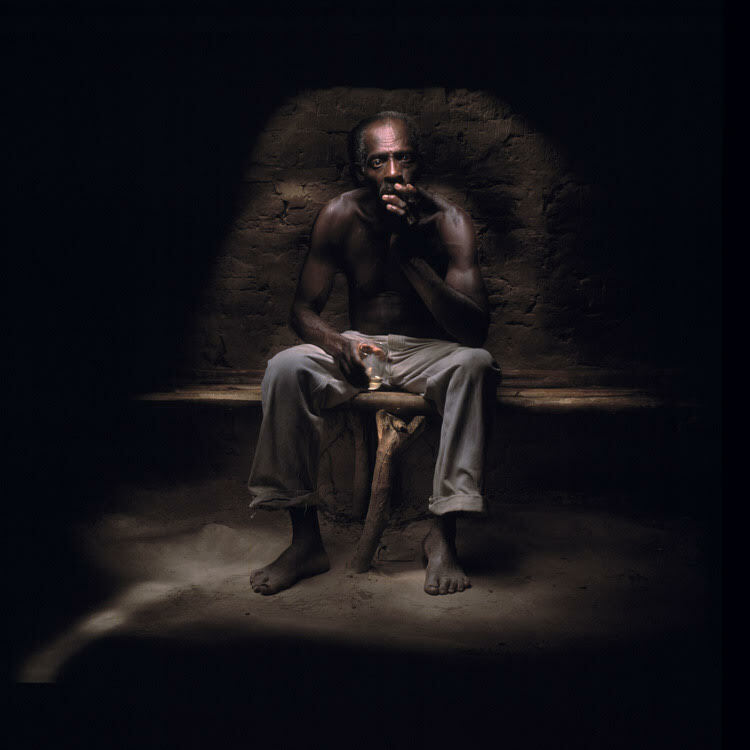 The nocturnal photos of his internationally awarded series “Vão de Almas,” that can be translated as valley of the souls, sheds some light on the African slave descendants’ lives of the isolated quilombo community of Kalunga, in Brazil’s central state of Goiás. The work of Japanese-born urban photographer Tatewaki Nio, who lives and works in São Paulo, was shown last year at the Fondation Cartier in Paris at the exhibition Southern Geometries, from Mexico to Patagonia. Tell us about his work. Tatewaki Nio presented in Paris his “Neoandinas” series that we are now showing. He shot it during a trip to the Andean Bolivian town of El Alto. Amidst the ochre-mud monochromatic local nature of this remote, arid region emerge vibrantly colorful, kitsch building complexes with flamboyant geometric motifs. 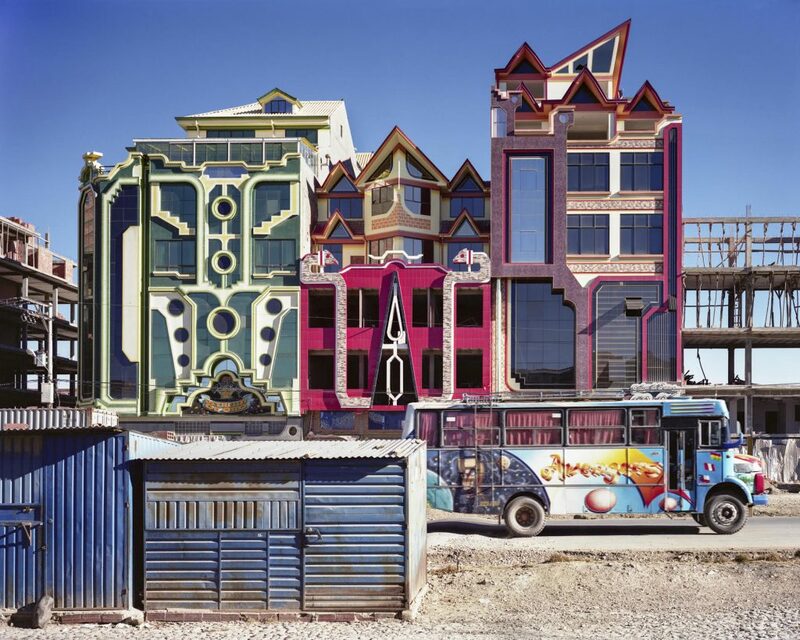 They are the work of forty-seven-year old ex-bricklayer Freddy Mamani, a Bolivian engineer and architect who is leading a new wave based on pre-Colombian roots called Neo-Andean style architecture. The extravagant architecture of The Neo-Andean series in contrast to the poor surroundings brings up the issue of the fast-paced globalization process expressed in the landscape captured by Nio’s lens. What about the work of the youngest of the group, thirty-one-year-old artist No Martins? No’s work is rooted in São Paulo’s street and graffiti art, known as Pixação. 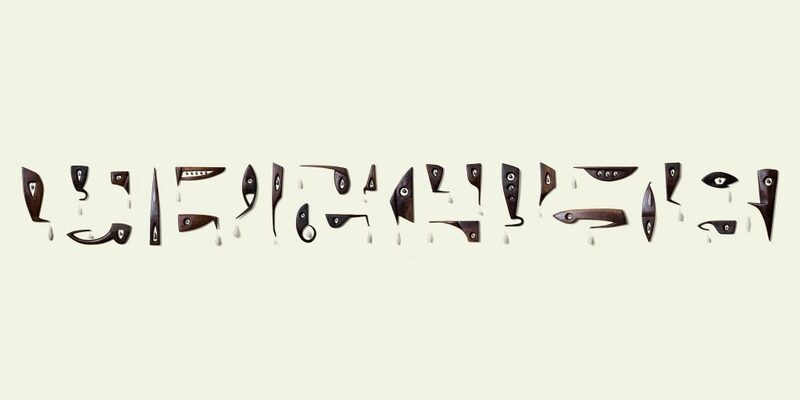 His work aims to place in the contemporary landscape the Afro-Brazilian body, subject to all sort of violence and prejudice. The artist has made a video-performance at Praça da Sé, a square in the old center of São Paulo, to denounces the condition of Brazil’s prisons, one of the most perverse facets of the country’s racism. He was caged and blindfolded for passersby to see during four hours straight in a cold winter day. The people had all sort of reactions, from compassion to indifference to irritation to feeling of strangeness. 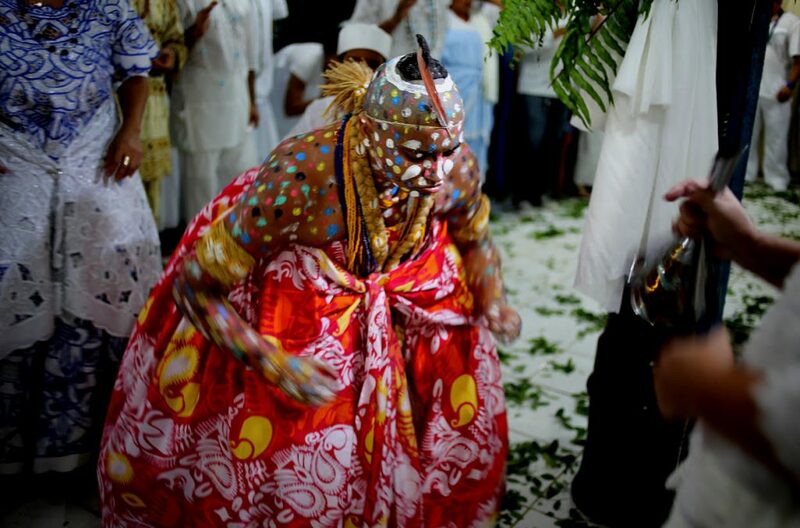 The performance was enacted precisely having São Paulo’s Palace of Justice in one side and on the other, the public sculpture, Martelo de Xangô (The Hammer of Xangô), an orisha associated to justice, by renown Afro-Brazilian sculptor Rubem Valentim. 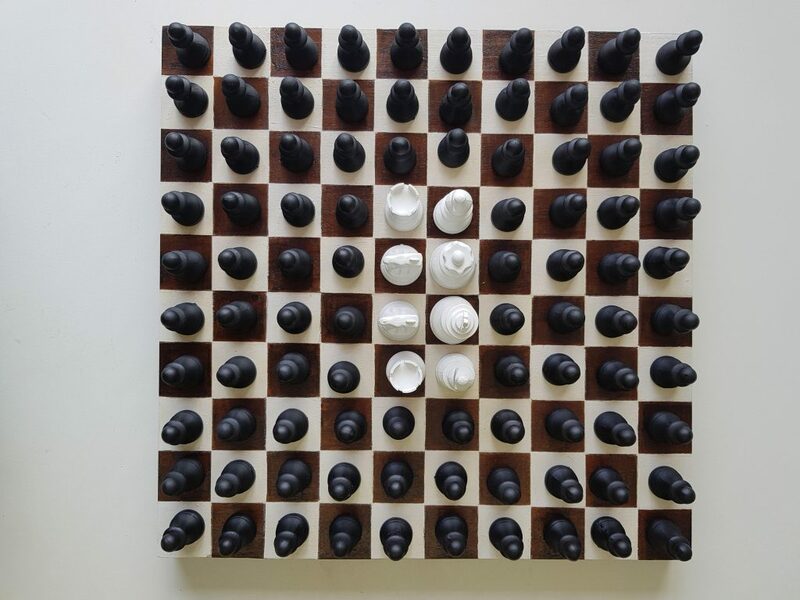 The work now on show is the sculpture “Game” where a majority of black chess pieces surround a minority of white chess pieces in the center of a black-and-white chessboard. It alludes to a landscape structured and shaped by racism. Now let’s wrap up with the remaining two artists, both from the northern capital city of Belém, sculptor Osvaldo Gaia and photographer Guy Veloso, who participated at the 2010 São Paulo Bienal. Both Gaia and Veloso, each in their very own specific narrative, demonstrate a strong connection with life, nature and the divine. Gaia’s oeuvre is based on his researches on the Amazonian universe. The artist creates curious sculptural structures from unusual objects and fragments he collects from his native environment. His narrative comes from his Amazon roots: the vegetation, the tree-trunk canoes, the lacy waterways of the igarapés [local Indian name for bayou], the ribeirinhos [bayou natives]… Inspired by the richness of this unique ecosystem, Gaia creates tool-like pieces with bizarre but elegant sculptural forms. The other artist from Belém is photographer Guy Veloso. The sharing and mediation that occurs during popular manifestations of religious character is at the core of his imagistic research. At the exhibition, Veloso presents a series based on religious trances, “Penitentes: dos Ritos de Sangue à Fascinação do Fim do Mundo”(Penitents: from the Rites of Blood to the Fascination of the End of the World). His images are able to be both documental as well as charged with a deep spiritual aura. The close relationship Veloso establishes with his subjects puts him and his camera in the same vibration and faith. Looking at his photographs one clearly feels an amazing flow of energy.